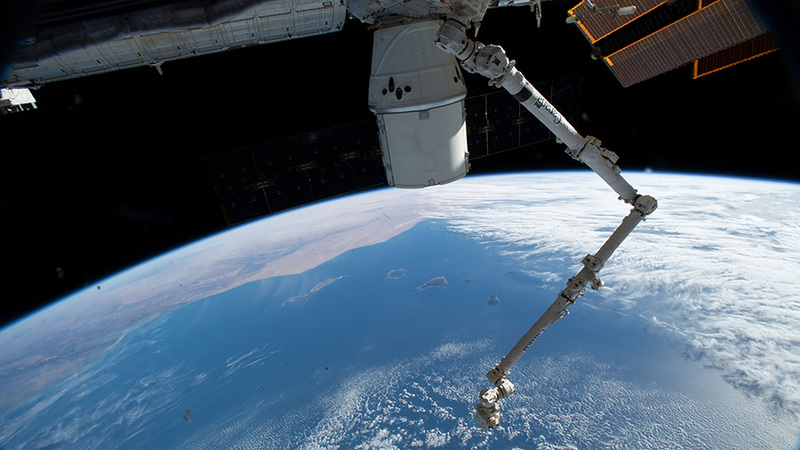 The SpaceX Dragon cargo craft and the Canadarm2 robotic arm are pictured attached to the International Space Station as the orbital complex was 251 miles above the Atlantic Ocean about to fly over Morocco. The Expedition 58 crew members are packing the SpaceX Dragon space freighter ahead of its return to Earth on Thursday. Ground controllers are also readying communications gear and robotics systems prior to Dragon’s departure from the International Space Station. Astronauts Anne McClain of NASA and David Saint-Jacques of the Canadian Space Agency are wrapping up final transfers of completed science experiments in Dragon today. The duo is loading science samples from several experiments for return to Earth, where they will quickly be delivered to investigators around the country for analysis. Engineers on the ground are testing communications and control gear that will be used to monitor and command Dragon after its release from the station. Robotics controllers are also powering up the Canadarm2 robotic arm today to grapple Dragon before its removal from the Harmony module. Would it be possible to be 251 miles above the surface of Saturn or is there no real surface that is hard just liquid state gas?